Korhonen's fluency gives a fragrant spaciousness to the music that allows each detail to shimmer with significance within the context of the whole. Simply put, this is masterful playing on every level. Korhonen's playing is outstanding throughout. The music is awash with rippling arpeggios, airy harmonics, lyrical melodies and sometimes violent strumming; these Korhonen relates to their more rational syntactic underpinnings with the skill of an interior designer who happens to be possessed of a peculiar genius. This CD features Finnish guitarist Timo Korhonen, who is an ardent champion of contemporary music, with three works for guitar solo. 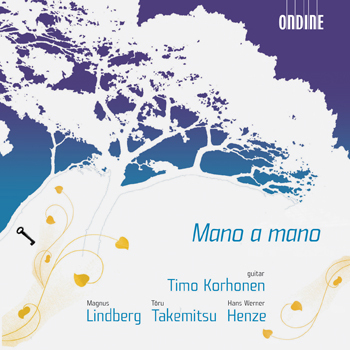 Described by the Finnish press as "a hedonistic feast of constant playing with sounds and sonorities", Mano a mano (2004) - the title is a quote from Argentinean tango legend Carlos Gardel - is Lindberg's first piece for solo guitar, dedicated to Timo Korhonen and recorded here for the first time. In the Woods (1995) is Takemitsu's last work for his favorite instrument; the three movements are dedicated to John Williams, Kyoshi Shomura and Julian Bream who closely collaborated with the composer during his career. Royal Winter Music is Henze's most important work for guitar, which he wrote after his politically charged period, in 1975-76, for Julian Bream; the six pieces of the First Sonata deliver musical portraits of characters from the Shakespearean world; "through masks, voices and gestures, they speak to us of great passion, of tenderness, sadness and comedy: strange events in people's lives..." (H.W. Henze).